It has been days since a solid report of reception has come in, it is certain SuitSat's batteries have died. Thanks to all who participated in this experiment! This page shows manually entered reports from people who heard SuitSat. ei7bfb 20060220223154 Nothing heard on 145.990mhz from suitsat this pass. Mouse 20060218022224 Received on handheld scanner with home made yagi. Heard data bursts with a voice in Russian. Mouse 20060218005458 3 received on handscanner and an yagi on 437.800. Heard a few data bursts and then a male voice saying:_coming out the other way_. The rest of the voice was untintelligible as suit sat passed over. KA3JAW/4 20060217105038 1 AO-54 Detected, Five second carrier, RF signal 1.05 db at 11:03:47 UTC on 145.990, FM, Ant. AZ: 045, EL: 037 deg. PD0RKC 20060217014319 1 Good Signal, heard USA msg with special word FREEDOM! also weak SSTV picture, I will send audio to AJ3U site! KI6BGI 20060216134207 1 At 75°, almost full quieting 2X _2 seconds apart, at 89°, man_s voice 2X, then girl_s voice *This is SuitSat 1*, Arrow antenna & Kenwood TH-F6A HT. KC5TRB 20060216121322 1 Heard weak intermittent SSTV (not decodable). N9PSE 20060216041844 1 Vy wk, unintelligible voice and doppler-shifted CW: 4 el yagi. TKS! KC8RAN 20060216041801 2 HEARD _FREEDOM_ AT 21 DEG EL, RANGE 351.HEARD CW ID (RS0RS) AT 13 DEGREE ELEVATION WITH 9DB GAIN YAGI! DJ3AK 20060216025605 2 ...RS0RS, then english female voice with special word on 145.990 FM at 47 degrees max elev. PD0RKC 20060216012004 1 GREAT!!! Heard SUITSAT ID with telemetry and msg, I will send to AJ3U site! K1LEF 20060215101900 1 Heard SSTV very faint. WB6KDH 20060215065439 1 weak, with heavy QSB - _RS0RS_ ID, followed by male voice and quieting total of 39sec. 06:54:44utc, heard past zenith of 70º (57º), 4-element Yagi, VX-5R, no preamp. Still exciting to copy Suitsat, even though weak. PD0RKC 20060215023039 1 Suitsat VOICE! CW and yes!! !-> long time SSTV (strong moments!). PD0RKC 20060215010312 1 Heard SUITSAT voice (weak) but I have to analaze what language I_ve heard. YO8KGA 20060214232608 2 14.02.2006 23:26UTC Partial ID and telemetry: mission time (01)5776 min, bat 26.5V. Rig FT847 - ant half F9FT (8el) at 60deg el. Audio files at _www.yo8kga.org_. KC5TRB 20060214130003 1 Heard SSTV then female then male...weak & unintelligible. VK4IT 20060214091327 2 SSTV heard on 145.990 for approx 15 seconds with minimal fading using VX7 and ARDF 2m Tape Measure Yagi. Elevation was 65 degrees tonight. KC8RAN 20060214050244 2 Mr Smith is still alive, almost heard entire sstv sequence, but no picture. KA3JAW/4 20060214032544 1 AO-54 Detected, Three very weak flutter carriers _ 03:25:30, 03:26:10, 03:26:50 UTC, RF strength 0.85 db, 145.990 MHZ, FM. KE5DFA 20060213141249 1 Very weak, doppler carrier, only with slight traces of modulation 145.990 USB mode. VE6BLD 20060213091751 3 I captured five 30 sec clips 1 min. apart. 2.18 with doppler,2.19 special word canada,2.20 english,2.21 foreign,max elev.44 degrees fairly good audio .See AJ3U. VIKING-DX CLUB 20060213074204 1 Late report; Suit-Sat1 getting weaker. KC5TRB 20060213060823 1 Heard weak female voice. KC5TRB 20060212134820 2 Heard unintelligible female, a couple tones then male. VK4IT 20060212100633 1 Bit of SSTV, female voice ident, then more voice, possibly _minutes_ and _volts_. Very faint, with deep fading using Arrow Yagi and VX7. Elevation was 80 degrees tonight. BD-PA 20060212055852 1 Weak signal over Erie, PA- SSTV and voice, got about 90 seconds recorded, no telemetry. KG4ESJ 20060212055411 1 extremely weak voice heard on 145.990 (unintelligible), followed by possible CCTV signal. KG4ESJ 20060212055107 1 extremely weak voice heard on 145.990 (unintelligible), followed by possible CCTV signal. DJ3AK 20060212025954 3 now with 2.3 wl yagi at 65degr. elev. : good receiption of voice THIS IS SUITSAT-1 AMATEUR RADIO STATION RS0RS, then weak female voice message on 145.990. TA1D 20060211222141 1 I heard CW ID and SSTV puls with Doppler shift in SSB mode,but not readable in FM mode. KD4UYP 20060211133659 1 Interesting audio signature this morning. got carrier most of the pass but could not make anything out (while live). did get 2 characters CW above the static..
KE5DFA 20060211132610 1 I heard a weak Doppler shift carrier with traces of modulation 145.990 USB mode. VE6BLD 20060211131719 1 Good morning again! At 06.17.31 and 19 degrees very very weak audio clips, more same at 06.18.09 and 28 degrees, then at 06.18.59 and 43 degrees cw id and fairly good full SSTV sequence!!. I will clean up and sent to AJ3U, then the last I heard was at 06. N2ECR 20060211053459 2 Heard what sounded like Asian female (Japan?) then later heard SSTV data. 29.8 EL/183.1 AZ. Using an 8ft Vertical Omni. KA3JAW/4 20060211052933 1 0 AO-54 (Suitsat) Detected, 145.990 FM, Signal 1.25, SSTV about 5 seconds in duration, 0525 UTC (0025 ET local). SQ9SY 20060211040434 1 Traces of modulation (USB / 145.993-145.898) - fast doppler shift, max elevation was 83 degrees, antena - dipole + 20dB preamp. Nothing on FM. VIKING-DX 20060210161218 1 Very weak. Elevation could have been better. KE5DFA 20060210143637 1 Weak Doppler shift carrier with traces of modulation on 145.990 USB mode. KC5TRB 20060210143157 2 Copied female voice that said _SuitSat_. W8PAT 20060210130210 3 144.990 FM Strong enough today to be heard over S7 interference. M0JFE 20060210083227 Very weak sstv tones folowed by in audioble speech Equip FT1500M & SQBM1000 co-linear. F6BYJ 20060210070426 1 El max 79 - Force of the signals identical to the previous days. perceptible in SSB almost all length. KB9KX 20060210045958 1 Weak Cw heard on 145.990 for about 15 -40 sec. KA3JAW/4 20060210045749 1 0 AO-54 (Suitsat) Detected, 145.990 FM, RF Signal 0.75, slightly above noise floor with two .25 second carriers at 0454 UTC (2354 ET local). 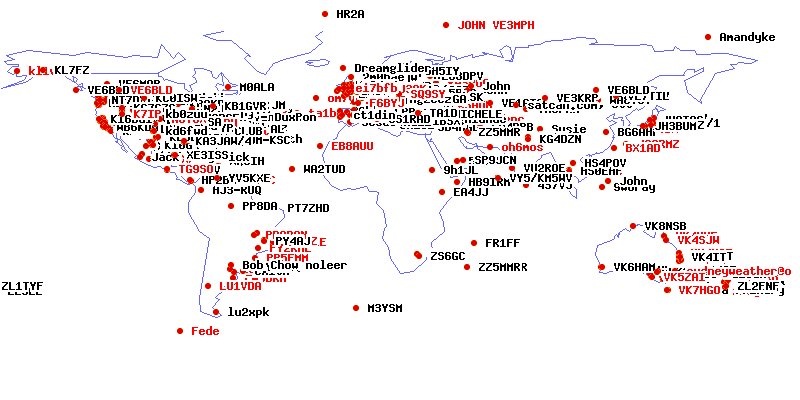 KB9KX 20060210032313 1 Vry weak CW heard on 145.990. Could cpy R ,S , and zero. KH6UX 20060209203028 1 Weak signal in the noise, 145.990. heard voices(perhaps Japanese) and the number _5_ in morse code. VE6BLD 20060209154022 1 The pass at 8:37AM was only max elevation of 13 degrees..only copied very very weak of audio...gotta go to work. Paxton 20060209141456 4 Heard several data bursts, also some odd pulsing sound that must be SSTV. VE6BLD 20060209124643 yahoo!! !I have a good 22 sec clip including the special word for CANADA!!! Received at 5:31:38 at an elevation of 76 degrees with S9 +15 signals. I think this is my third special word! 73 to all from VE6BLD DO32. VE6BLD 20060209124045 1 another very early morning from Lacombe, weak audio at 22 degrees at 5:30:30, go to AJ3U for files.waiting for next 78 degree pass!!! VE6BLD 20060209123422 1 received more weak audio at 5:33:30AM. hard to copy voice.Check AJ3U for all my reception files. By default only the last 200 reports are shown, click here to see all reports. A few articles about SuitSat: NASA, AMSAT, CNN, MSNBC, and pictures from ISS of SuitSat preparation.